The Monterey Academy of Oceanographic Science (MAOS), located at Monterey High School, prepares public high school students from throughout Monterey County for academic and career success. This is accomplished through a challenging curriculum enhanced by collaboration with the many marine related academic programs, research organizations and businesses in the area. Students achieve success through a rigorous, interdisciplinary approach to science and technology, with an emphasis on real-world problems, contact with oceanographic experts, hands-on science labs, field studies, and internships. 2. Computer technology in class and lab assignments is critical to student skill development. Using real-world problems in the classroom ensures relevant application of theory, and better prepares students for their future. 3. Developing in-depth organizational, communication, and presentation skills is key to preparing students for success in their careers. 4. Hands-on science labs, field studies, collaborative research projects, and guest speakers are integral components of the science curriculum, and make the connection for students between academic learning and their future career choices. 5. Internships provide students with a meaningful experience, which enhances their understanding of working in the professional scientific community. 6. A student population representative of the ethnic and socio-economic population of our community is ideal to ensure a rich academic and social learning experience. 7. Public high school programs that provide a high degree of challenge for capable and motivated students are a critical element in addressing the national shortage of qualified graduates in the fields of math, science, and engineering. A. MAOS (Monterey Academy of Oceanographic Science), is a college preparatory academy located at Monterey High School. The program is designed for motivated students who are interested in a rigorous college preparatory curriculum with a focus on math and science. A. MAOS has a small-school environment, an integrated curriculum, hands-on learning through labs and field studies, and many activities focusing on the ocean, science and technology. Students participate in field studies and hear guest speaker presentations, as well as completing a mandatory 80 hour internship in a math or science related field. Completion of the MAOS program assures that students have completed all admission requirements for the University of California (UC) and California State University (CSU) systems. A. MAOS goes on a variety of field studies that deal with ocean, sciences and technology. Past visits include Monterey Bay Aquarium, Moss Landing Marine Lab, Naval Postgraduate School, Hopkins Marine Lab, The Steinbeck Center, Elkhorn Slough, Asilomar and Del Monte Beach. Guest speakers are usually representatives of local scientific and research organizations working in the fields of oceanography and marine science. This aspect of the program makes the connection for students between academic learning and real world application. A. Student should be willing to learn and interested in rigorous classes which MAOS offers in preparation for college. Selection is open to students throughout Monterey County and is increasingly competitive. Admission is based on an application process, which includes transcripts, teacher recommendations and an essay. Applications may be downloaded from the MAOS website at www.maosmontereyhigh.org or this web page (on the right side of the page). A. MAOS is a non profit academy located at Monterey High School. There is no “tuition”; however grants and parent donations provide the necessary funding for the program. A donation of $650 per year (per student) is requested from each MAOS family. 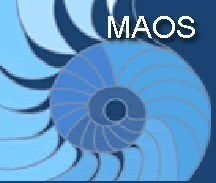 A. MAOS is currently overseen by Friends of MAOS, a 501c3 nonprofit organization whose community based board of directors, together with the MAOS staff, are responsible for long-range planning, community relations and funding for the program. MAOS receives funds through grants, parent donations, and fundraisers held throughout the year.